750 ml bottle. Pours hazy orange amber with a monstrous white head that continuous to grow for a while and eventually leaves some lacing. The aroma is lots of brett - earthy, tropical fruit, and funk. The flavor is lots of earthy acidic brett with some tropical fruits and a decent bitter finish. The mouthfeel is medium bodied and a little watery. Overall, a great brett beer. The collaborative efforts of Mikkeller and Anchorage brewing operations yields a MIkkeller-heavy ale with a lot of earth, spice, and overall Euro-grit. Upon the pour, the murky golden ale sheds a billowing ivory head that nearly topples the snifter. Racy with its carbonation, the ale takes on champagne proportions. As the foam settles, the ale laces with well defined rings at each sip. Pungent aromatics of straw and hay are piled upon with a crisp whiff of sea air, saddle leather, and strong earthen spice. Peppercorn, cumin, peat and a medicinal note upholds the ales phenolic compounds. A background of citrus, white wine and aged woods keep the complex scents coming as the beer warms. Tartness overshadows sweetness even on the earliest of palate. Limes, sour grapes, under-ripened oranges and berries start the show- just ahead of a middle palate of earth and spice. Leather, cork wood, oaked chardonnay, pepper and peat create a spiciness that pulls away from the fruit. A finish of medicine, sweat, brine and saw dust ensures a dry and dirty taste. The first sip erupts on the tongue and completely engulfs the mouth. As the champagne-like effervesence yanks the beer from the tonuge it forces a quick finish well before the opportunity for taste is fully explored. A slight blockade in the throat allows the flavors of the ale to be more appreciated in aftertaste than in initial taste. Dry peppery warmth and an echo of attic must are lasting memories that quickly wisp away. After having several of the It's Alive! varietals, its all those taste that are well represented here. Unfortunately any Anchorage attributes are lost on the palate. It would have been fun to see how their "funky-fresh" complements would have assisted the taste here. Those would have been much needed to overcome the strong band-aid taste and rather dull earthiness. 750 ml caged and corked bottle. Served in a tulip, the beer pours a hazy golden/orange color with a couple inch off-white frothy head that sticked around for a long time. There's also a good amount of lacing. The brew smells like brett, cherries, candied oranges, apples, pears, and some medicinal herbalness. I think the taste is similar to the aroma, it tastes like brett, apples, pears, lemon peel, tropical fruit, and some herbs. Mouthfeel/body is medium, it's creamy and is well carbonated. The soft carbonation helps make this easy to drink. I think it's a good brew. $12.99 a bottle. 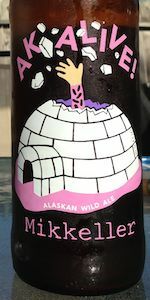 Bottled and Brewed by Anchorage Brewing Company, despite it being under "Mikkeller"
Smells like prickly pear and dragon fruit smushed together in horse blanket and made a juice out of it. This one smells sour and funkaaaay. Taste was startling in a good way. Initially I really like the flavor because BAM!!!! you are hit with sourness with the carbonation stinging your tongue. Then you start tasting the bright citrus tropical fruit flavors along with the funkiness (which is very characteristic of ABC). By the time I'm half-way through the bottle, although still tasty, plateaus in a slightly banal way. I give it an A- still. I really enjoyed it. I kinda like how it's more sour than most of ABC's beers. Worth the try! Poured into my large Gulden Draak tulip, AK Alive! is clear gold with a huge, thick white head leaving massive chunks of rocky foam. Smell is zesty minerals and tropical fruits, pineapple, saisonish, with just a hint of funk. Mouthfeel is dry, foamy, light, oily. Drinkability is pretty good, strait forward bretty blonde, but a little over-primed, and with too abrupt a finish. Much thanks J! Drank on 9/1/13. Poured into an unbranded tulip. A: Hazy golden-orange with a nice light tan foam head with good head retention. S: Apples, pear, brett. Some horse blanket going on. Really funky. M: Pretty highly carbed, which I thought kinda worked in it's favor. Some people mentioned that this was a gusher, but I didnlt have that experience. Nice, medium body. O: Overall, I thought it was a pretty nice beer for the price ($13 for a Mikkeller beer from Alaska, purchased in VT). It's certainly not overly sour, but it has a nice funk to it. Poured from a very active bottle a hazy apricot color with a billowing three fingers of off-white head. Fairly good amount of sticky lacing left behind. Very earthy and yeasty aroma upfront with hints of lemon, wine grapes and cracker. The taste was white wine, lemon and yeasty notes along with fresh earth and caramel malts. Finished with notes of cracker and a bitter hop bite. Medium bodied and dry with a fairly sharp carbonation. An interesting and enjoyable American Wild Ale from the collaboration of Mikkeller and Anchorage Brewing.